South Korean girl group Twice will hold its first individual concert ever in February, its management agency said Tuesday. 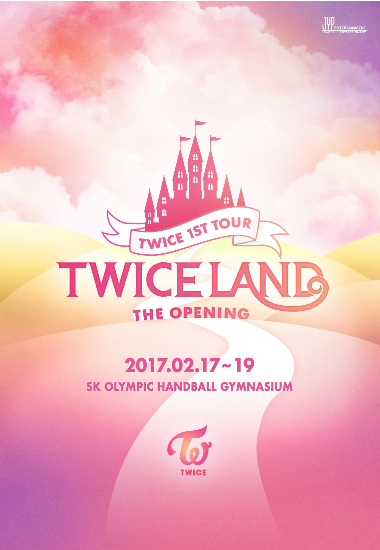 The "Twice Land - The Opening" concert will take place at SK Olympic Handball Gymnasium in Seoul's Olympic Park from Feb. 17-19, JYP Entertainment said. After the concert, the girls will embark on an overseas tour whose schedule has yet to be announced. Debuting in October 2015 with "Like OOH-AHH," Twice has swept local music charts with "Cheer Up" and "TT." All of the three hit singles generated more than 100 million YouTube views, with the last one passing the 100 million mark in the fastest pace among K-pop idol groups.